The European GNSS Agency (GSA) has released its third market report, which predicts an installed base of 7 billion devices worldwide by 2022 — almost one for every person on the planet. 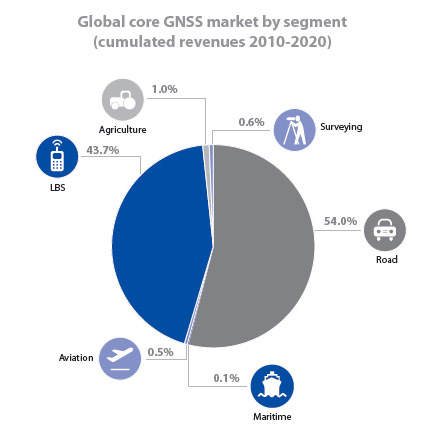 According to the study, “GNSS Market Report Issue 3,” compound annual growth rates (CAGRs) for GNSS “core” and “GNSS-enabled” revenues will increase by 9 percent through 2016 and 5 percent through 2020, reaching a total of about €350 billion (US$478 billion) per year. 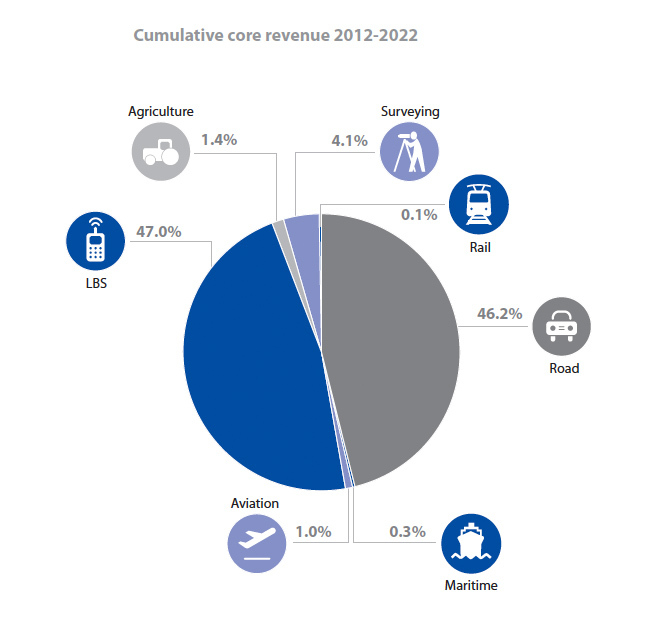 Core revenues will comprise about €100 billion (US$137 billion) of the total in 2022, the GSA report forecasts. The core market comprises the various GNSS receiver form factors (from chipsets to end user products). For multi-function devices, such as smartphones, the core market includes the value of GNSS functionality only (rather than the full device price) and service revenues directly attributable to GNSS functionality (e.g. data downloaded by smartphones to use Location-Based Services). The “enabled” market repre­sents the services and devices enabled by GNSS, and includes the core market. The 72-page report prepared by the GSA’s Market Development team is more comprehensive than earlier GSA market studies and features separate sections on specific market segments: location-based services (LBS), road, aviation, maritime, agriculture, surveying, and — included as a distinct category for the first time — rail. The report is available on the GSA website. Smartphone devices will account for nearly half of the cumulative core revenue for the period 2012 to 2022. “Competitive pricing has made smartphones more affordable and their market share is rapidly increasing compared to traditional mobile phones without GNSS capability, leading to an increase in GNSS penetration, especially in lower income countries,” the report states. Global shipments of GNSS-enabled LBS devices have grown from 150 million to 800 million in the last five years (40 percent CAGR), according to the GSA report. In Europe and North America, more than half of mobile phones have GNSS capability. New smartphone capabilities alongside integrated technologies are blurring the market segment breakdowns, as LBS devices increasingly support navigation and services in other applications. New GNSS platforms — including tablets, digital cameras, fitness and people-tracking devices — will drive additional growth in the future, the report predicts. The GSA researchers note that multi-constellation devices that use all navigation signals in view are becoming more common in the market. GLONASS is the second GNSS constellation choice of receiver manufacturers after GPS, with 30 percent of units being “Galileo-ready.” BeiDou is beginning to be incorporated into user equipment, particularly those based in the Asia-Pacific region covered by the existing Chinese GNSS constellation. More than 70 percent of models available on the market are capable of receiver satellite-based GPS augmentation (SBAS) signals. Analysis of each market segment include a description of the corresponding value chain, market trends in that segment, and examples of companies and products, from chipset manufacturers through device vendors, service and content providers, app developers and retailers, and app stores.